The need for deep reflection time, personally and collectively is increasingly evident in our corporate societies and our communities. Wilderness can play a significant role in the quest for vision and new direction and for a quiet long forgotten. The Vision Quest is an ancient tradition and includes four days and nights living alone in nature. Based on indigenous peoples rites of passage, this 11-day process is an opportunity to review one’s life, mark a particular time of severance or threshold, review, remember, retreat. It is a profound personal transformation process in which each participant sets and tracks his or her own course. The history and ethos of vision quest and its practice through the decades. 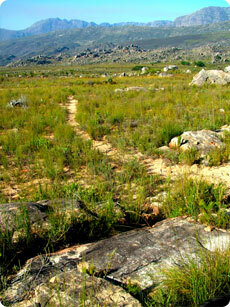 The Medicine Walk – a day spent walking in a wild place, one month prior to the start of the programme. Clarifying intention. What is it that I hope to take away from this experience. Writing it down. What to expect in the mountains, in the way of weather, terrain, animals, the physical challenge. Dietary preparations. What to eliminate and how to prepare our bodies for a fast. The individual belief systems and life journeys represented in the circle. Clarifying vision intention in greater depth, with each participant. Building psychological, mental and emotional readiness. The Four Fold Way… the way of the Warrior, Teacher, Healer and Visionary – a model for use in the solo time to maximize the work to be done by each one, based on the work of Dr Angeles Arrien..
Safety, health issues and requirements, rituals and ceremonies. Finding the spot that you will call home for four days and nights of solo time, getting your 20 litres of water to that place and creating the stonepile system with your nearest buddy. 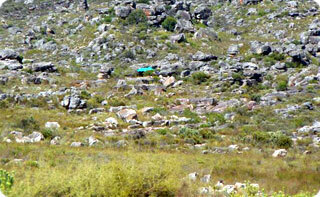 Four days and nights solo in the Grootwinterhoek Mountains, and an all-night vigil on the last night. Storytelling: Bringing our best listening and attention as we receive each one’s story and through a particular reflection and mirroring process our understanding of what we have done, is expanded. Re-incorporation and how we take on our worlds once more, constitutes our final module. Please see the article on Vision Quest on our articles page.